THIS ITEM HAS BEEN DISCONTINUED. CEBR411 IS THE SUGGESTED REPLACEMENT. 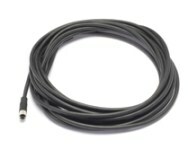 This 5 meter cable has a 4-pin Binder connector on one end and lead wires on the other. It is compatible with the auxiliary connector on Ace Camera Link models. Use this cable for connecting the camera's input/output signal. If you're not powering the camera from your frame grabber via PoCL, this cable can also be used for connecting power.